Based on the limited information here, the GN4IN suffix appears to identify non-working cards in the 64gb line, and working cards within the 128gb line. And the -ANCIN suffix appears to identify non-working cards in the 128GB line, and working cards in the 64GB line. Or none of it means anything, because there are working and non-working batches within these lines. The only reliably predictor at this point appears to be the serial numbers on the cards. So far, we have two working numbers. -824G (128gb) and -860G (64gb), and one non-working number, -838G (64gb). The 64 and 128gb cards currently shipping from B&H and Adorama appear to be the non-working versions, for devices which include the BMPCC, the BM video assist and some Sony cameras. The 64GB versions currently shipping do work in the BMPCC 4K. Marc Duchêne, Looks like you got a card from the known “not working” batch. I would return it for a refund or a card with a different batch number (the number on the back of the card starting with B). Last edited by Denny Smith on Thu Nov 15, 2018 6:21 pm, edited 1 time in total. Good detective work, but I think I’ll stay with Wise cards that are tested on their cameras. Bestbuy just shipped me a 64gb Extreme Pro SD card which is compatible with the BMPCC (and the BMPCC 4k). This is a v30 card with an "ANCIN" designation and ending with the same 860G serial number as pictured above. Same packaging as well, with the card in a bubble on the cardboard base, which is unlike the most recent release of the 64Gb card, where it's inside a box. Last edited by Denny Smith on Fri Nov 23, 2018 7:23 am, edited 1 time in total. Denny, I don't know whether I should bother to respond to you at this point. Go back and read this thread. Only one person here declared that the v30 cards were, universally, the bad ones. Any guesses who it was? If you need another hint, it's the same person who, in a thread devoted to hard information -- what works and what doesn't -- insisted on instructing the readership on matters not at issue and who made claims unsupported by the known facts. How about a little restraint, when you're not well informed? Contributions which are flat out wrong are hard to ignore. Last edited by Denny Smith on Fri Nov 23, 2018 7:24 am, edited 1 time in total. I'm a new (original) Pocket Camera user (it just arrived today!!!) and was distraught to find my brand new 256GB Extreme Pro card unrecognizable to the camera. Please, Blackmagic Design, is there not some software fix for this? Everyone else, are there any U.S. sources for new working cards? Denny Smith wrote: Marc Duchêne, Looks like you got a card from the known “not working” batch. I would return it for a refund or a card with a different batch number (the number on the back of the card starting with B). Thank you for your help. So I followed your advice, I returned the card to receive a new one ... which has exactly the same serial number and does not work anymore. Bad luck. Can we hope for another solution? Just as a reference we are now having the same problem in South Africa. Probably tried 5 cards i will forward this thread to the local Sandisk rep. I recently purchased a BMPCC, Micro and V5" BM Video assist. Hugely excited about filming in RAW i headed off to a registered SanDisk reseller to purchase the recommended SanDisk Extreme Pro UHS 1 SDXC 95MB/s V30 cards. Eventually phoned the SanDisk distributor and tried 2 more brand new cards....Even 64GB ones. Nothing worked. Tried formatting Exfat...even tried MAC format...nothing worked. Tried Sony and Lexar UHCII's and I's, worked first time. It's evident that Sandisk changed something on their Card Firmware. you'll probably get a working card. What you don't want is the new package, where the card isn't recessed into the cardbox, but is inside the box. Note, however, that this same packaging doesn't guarantee compatibility in other sizes. I've also heard, but haven't verified, that all versions of the 32gb card continue to work. You might also want to try Sony SD cards, which are reported to work in the BMPCC and other devices where the new Sandisk cards fail. Thanks John...now to try and hunt down somebody's old stock!! Why the fixation on Sandisk with their track record of improvement to their firmware that no longer work with BMD cameras? I’ve no plans to go with them at anytime. Last edited by rick.lang on Wed Nov 21, 2018 9:48 pm, edited 1 time in total. rick.lang wrote: Why the fixation on Sandisk with their track record of improvement to their firmware that no longer work with BMD cameras? I’ve no pans to go with them at anytime. I kind of agree with you on that. I gave up on Lexar cards years ago after numerous issues and while I have Sandisk cards, I've given up on them as well. I've been using Samsung cards for a while now in various applications without any issues. The EVO+ cards seem to work with the BMPCC4K quite well and are reasonably priced. rick.lang wrote: Why the fixation on Sandisk with their track record of improvement to their firmware that no longer work with BMD cameras? I’ve no plans to go with them at anytime. OTOH, since you're not shooting with the BMPCC, I can understand that cards qualified for that camera wouldn't be of interest and you'd have no plans to use them. This place gets wackier by the day, no? Good point, John; I saw BMPCC but when I posted today I was thinking BMPCC4K! My mind is a bit preoccupied with a few other things. 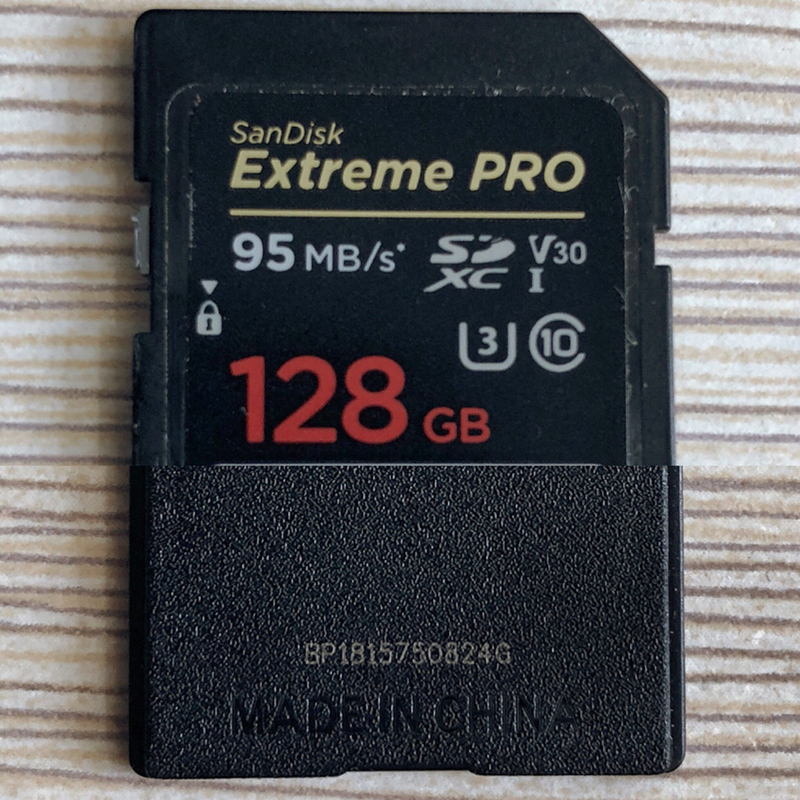 I got the BMPCC (1080p) version used and was using a 32 GB Sandisk Extreme quite happily and also thought about buying two 128 GB Sandisk Extreme Pro cards. Failure. As mentioned, both cards do not work with firmware 2.1 on the BMPCC. Saturn might be able to take them back and I look for those compatible older cards. For now I have a 32 GB card that works. Not sure how helpful the following info is, but I too have collided headfirst with the "No Card" issue with the 5" BMVA on a pair of new 128GB Sandisk Extreme's in the last week or so. I have used lots of other Sandisk cards with the unit without issue before now. Before seeing this thread, thinking they might just be faulty I registered them for a return and bought 2 x ExtremePros to replace them. Just received them and tried the first one and that's sadly giving me "no card" as well. For what it's worth I have an Extreme with V30 branding (bought November 2017) that works absolutely fine, and two identically branded cards that show no card. As with others here, they work on every other device I've tried, including a new Hyperdeck Studio Mini. Picture attached. Sadly I don't have the packaging codes to check on the two gold cards or the working one. All of these cards were bought direct from Amazon in UK, so the original supplier is anyone's guess. Obviously in the perfect world we would only ever buy proven cards from recommended retailers, but time and availability in a working shooting environment don't always allow this luxury. And whilst it's unclear what is at fault here, I must say this is the latest in several incidents that is making me think twice about Sandisk Products (same job I realised these cards wouldn't work in the BMVA I had a 480GB Extreme Pro SSD just fail also). Similarly, whilst I'm sure a potential fix for this isn't totally in Blackmagic's control... this thread proves there's an issue and I would love to see them come and make a public statement about it. I imagine if this issue were to crop up with with same (hugely popular) cards the new BMPCC4K there would be a lot of angry vloggers out there! Will follow this thread for updates, but my cards are going back to Amazon. This is hugely frustrating as the Sandisk Extreme PRO 95 hits the sweet spot for price and RAW functionality. Is it THAT difficult for Blackmagic to just have one of their engineers look at it and give us some sort of response. Alternatively remove all references from their manuals as they recommend this card!!! Anyone on this forum that represents the user community that has the ear of Blackmagic? BTW i messaged Sandisk and got a generic reply 2 weeks later with a copy and paste article of being mindful of buying only from registered dealers as there are counterfeit units out there...Like really Sandisk...is that the best you can do!!! vanschr wrote: This is hugely frustrating as the Sandisk Extreme PRO 95 hits the sweet spot for price and RAW functionality. Is it THAT difficult for Blackmagic to just have one of their engineers look at it and give us some sort of response. Alternatively remove all references from their manuals as they recommend this card!!! It is frustrating. As has been mentioned, the SD card list for the BMPCC dates to March 2015 and only includes SanDisk cards (and only SanDisk Extreme Pro for CDNG Raw). You would think an ideal summer intern task would be to keep that list current. Heck, I'll drive to Fremont on a Friday and volunteer to test if they can provide the materials and test procedures. The SD card list for the Video Assist products dates to June, 2017 and is heavily SanDisk UHS-I, especially for the original VA (again, as has been noted already in previous posts). Both lists specify UHS-I with the VA list specifically saying to only use UHS-I. And these lists reference specific part numbers which must have disappeared from the market long ago. I know BMD have a lot of products but stuff like this would seem to require minimal resources to deliver a disproportionately higher return on customer satisfaction. Unless the answer is "the only cards that use to work are no longer being made and you're basically out of luck". I guess that would be a hard thing to admit. But if the answer is "buy expensive UHS-II cards", it would nice to at least have the official lists reflect that information. How hard would that be to do? Bought one Extreme pro 128Gb and it's replacement from amazon... both show "no card" here in the UK. I don't think this has been posted yet; apologies if it has been. It references the issue for Sony users (dated Oct. 6, 2018). I did a quick check at B&H and these appear to be about twice as expensive as the SanDisk Extreme Pro alternatives but given that prices have fallen the last couple of years, are not prohibitively expensive if you have no other choice. Of course, I have not seen confirmation that these Sony cards are compatible with the BMPCC and/or VA, certainly not from BMD. Does anyone use the Sony cards? A UHS II Card is not going to give you the full write speed in a UHSI device, like the original Pocket or Video Assist. A UHS I Card/interface uses one slot. The UHSII cards uses two slots to get their faster read/write speeds, and you only get the performance for video when you have the UHSII interface for a UHSII SD card, found in the VA4K and the newer BM cameras, like the new Pocket 4K. You can use a UHSII card in an older UHSI device, but you will not get the performance required to record video that requires the 95Mbs write speeds. I have two newish old stock (pre V30/60) SanDisk Extreme Pro UHSI SD cards that do work in the original Pocket, Micro Cinema and Video Assist 5-inch units, available if anyone wants to buy them. I sold my BM equipment I used them with (Pocket and Micro Cinema camera/VA). They were used for two jobs I bought them to be used for, and have low hours/use. Recorded to twice and read from twice only, PM me for details/offers. Recorded to twice and read from twice only, PM me for details/offers. Denny I think you can name your price lol! There's going to be a fist fight over your cards. I couldn't have said it better myself!! How about we start spamming the BlackMagic Facebook page. #181204-000138 Case logged with Sandisk. Lets see what response they give this time. In the mean time Sandisk had this response to the Sony complaints! “As per the latest update, there is an updated controller in our SD cards where we are facing issue in some host devices. However, we cannot provide you a timeline on when it will be resolved. For time being, we would recommend UHS-II card for better performance.” "and 5 times the price!!!! So, unfortunately, for my a7iii I will be avoiding SanDisk cards, at least when it comes to the higher capacity/speed cards, which are an absolute must when it comes to 4k video. Yes, well put a Rick, but a UHSII Card is not likely going to,work either in the BM UHS1 Camera/recorder, like the Pocket, Micro and VA, where you needmthr 95Mps Speed. Denny Smith wrote: A UHS II Card is not going to give you the full write speed in a UHSI device, like the original Pocket or Video Assist. A UHS I Card/interface uses one slot. The UHSII cards uses two slots to get their faster read/write speeds, and you only get the performance for video when you have the UHSII interface for a UHSII SD card, found in the VA4K and the newer BM cameras, like the new Pocket 4K. You can use a UHSII card in an older UHSI device, but you will not get the performance required to record video that requires the 95Mbs write speeds. Thanks for clarifying this. All the more reason for the compatibility list to be kept current, as a casual review of the product specs don't highlight these caveats for the general buyer. should work at 90 to 95MB/s because it supports U3 and Class 10 standards. But of course "should" and "do" aren't always the same thing. Yes, I remember last year, there was a problem using UHSII cards on the VA 5-inch and Micro Cinema Camera, droping frames, because they could not keep up. HAHAHA and dont forget the LOVE! is working in the Micro camera Recording RAW. just did 6 minitue test... All looks good so far. PNY Elite Performance SDXC Flash Memory Card 64GB Class 10 UHS-1 U3 works for RAW recording on BMPCC, too. This card does NOT work in the BMPCC. It's recognized, but camera function is erratic. It does work in the BMPCC 4K, for HD and for limited run times in UHD and 4K @23.976.
one card recieved (serial #-0860G) works. Two cards (serial # -1839Z) do not work. All three cards work in every other device I have including a Canon 5DmkIV and a Canon 7D (in a CF adapter). How is it that Canon can produce a camera two years ago that works with SanDisks made today, but BM can't produce a video Assist that works with them this year? Centos 7.3, Intel Core i7 (7th gen), Nvidia GeForce GTx 1070 ti -> Dual HD monitors, DeckLink Mini Monitor -> 4k Monitor, 512GB SSD for OS, 4TB working drive, 100TB network storage Raid array, Resolve Studio 14.3, Fusion 9 Studio. Three of the 128GB cards ending in 1766G are all a no go on our Micro Cinema Camera. Just adding my frustrations to this post with SD Card media in my Video Assist 4k. I have, in the last 7 days, purchased my VA4k and so I'm stocking up on media. So far the 2x 256GB SanDisk Extreme Pro V30s don't get recognised, neither the subsequent 2x Lexar Professional 64GB V90 2000x. I have had to dig around for some older SanDisk Extreme Pro cards from my other rigs to get the VA4k to work. Surely a firmware update from BMD will allow these newer cards to work? No that its not just Sandisk, but also Lexar cards that are showing the issue? From what BM has said, and my understanding of the issue, Firmware in the camera is not going to control how the memory cells and FW in the SD card works. This is a complicated issue, with no simple solution. BM uses high data rate recording codecs, consumer type similar cameras use higher compressed lower data rate codecs, these new cards can suport. That is the main difference in a nutshell, SanDisk and other card makers are going with supporting the larger market share in these the last day of UHS1 SD cards that have been replaced by UHS2 cards and interfaces. When BM developed these devices, SanDisk and a few other cards supported this recording system. Making production of the original Pocket, and the Video Assist HD possible. Now the newer UHS2 interface is being used in these lower cost systems, which at the start had very limited SD card choices that worked. Now the situation has flipped/flopped. I saw this coming and sold my VA HD when the new 4K version was released. I got the PixE instead, which has better media support so far. But it is time to stock up on a few backup media cards to carry me over until the next recording system comes out. Last edited by Denny Smith on Wed Dec 12, 2018 6:07 pm, edited 1 time in total. I'm a newbie to using the BMPCC in Spain. I find that my pocket cine can't read any new Sandisk cards at all, but my 6 years old Nikon of similar age can read them all. How is it that the Nikon card reader dating from 2012 can read all of the cards rejected by the BMPCC? I contacted Blackmagic support in the UK who informed me that a firmware update is being prepared to overcome this. They recommended that I should only purchase cards beginning with SDSDXP - I bought a 128GB card beginning with that lettering and it didn't work! I find that newer Sony cards are working fine though. Interesting, BM USA is saying the opposite, recommending those with this issue contact SanDisk directly. Good to know the new Sony cards are working. Thanks for the update. Since the BMPCC, Micro Camera and Video Assis 5-inch HD are U3 compatible devices, these new cards may do the trick. Coming in 64GB also. Here’s hope that they will work. Denny, can you post a link to that new 128GB card that might work with the BMPCC? ShaneinSpain wrote: Denny, can you post a link to that new 128GB card that might work with the BMPCC? Thanks Seth, yes, that is the one. But until it is released and tested, we will not know for sure if this will be the fix from SanDisk, I am assuming it is. Hoping the new batch of cards do work. I bought this back in August/September and it worked fine. I had to return the latest cards I bought earlier this month. I didn’t get the serial/batch numbers. Are there any solution or recommendations finally from BM in respect of SD v30 cards? "That is the question." It is definitely a software problem ( something like "time run error" ). This type of cards takes appr. twice longer time to get "ready" symbol on the camera (in compare to old not v30 cards). So this card is recognized by BMPCC in 99%. Sometimes it is not recognized and I need to switch on/off the camera several times to get the card to be "ready". No (Raw) drop frames issues. Could this be the issue with the cards you're seeing? No, this doesn't seem to be the case. I have 3 SDSDXXG 128GB Sandisk Extreme Pro cards (bought on October and November 2018) and all of them are recognizable and fully functional in BMPCC. The prefix alone won't tell you. You need the full product code, but it's not consistent across the product line: the suffix which works for one size (e.g., ANCIN) won't work on another gb size. The full product code for the last working 64gb card has been provided in other threads, and it looks like Stmond can provide the code for the working 128 gb. Or try the equivalent Sony cards. Or any 32GB Extreme Pro card. Or wait for the new ones. Or swim against the current and give Wise Portable SSD and their CFast2 and SDXC cards a go. They’ll do the job.